Nestled in the hills of Mount Olympus, West Hollywood, Zorada Court is a new residence designed for L.A. family-friendly living at its best. The panoramic views are breathtaking, with the City at one vantage and the canyons in the other. But the real luxury is the simple elegance of the residence’s design and exterior living environment. Ecocentrix was commissioned by a local developer to help address a critical challenge in a sophisticated way. The conservative single-story home was situated on a tight mountainous property, with little useable space. In addition to expanding the home’s footprint, the Developer envisioned a spa-like atmosphere with ample outdoor living. The Ecocentrix team met this challenge head-on, focusing first on creating functional areas to accommodate a small family. 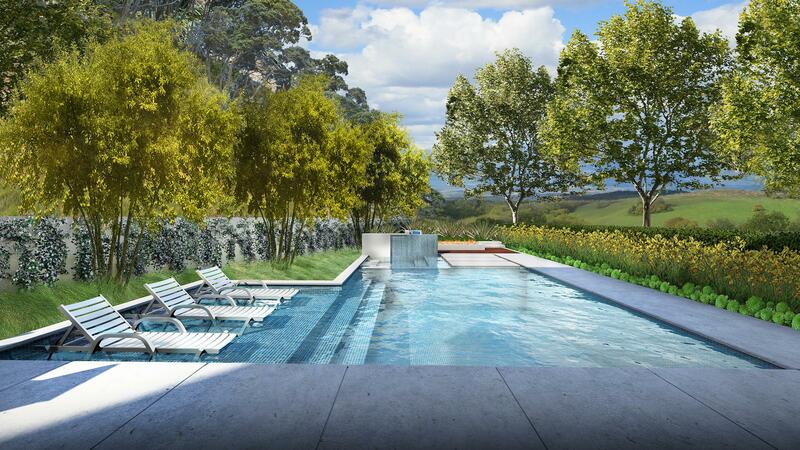 The design plan highlights the terrain, with restrained planting to harmonize with the agent hillside and give a lane for the rocky steep slopes to advance sculpturally into the frame. While celebrating the aesthetic of the environment, we are also conscious of the current climate and impact of design. Through proper plant selection and irrigation system design, this home will be water-wise for the future of our beautiful state.